She listens to her heart while he obeys his mind, she is friendly and energetic while he is reticent and serious, she connects instantly with people while he is happier by himself; she finds joy in the kitchen while he stays for hours in his study. Chithra Viswanathan (73) and K.S.Viswanathan (83) allow contrasts to co-exist having the perfect heart mind understanding. 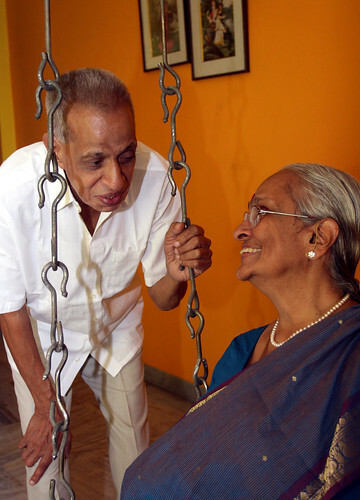 She grew up in Madurai in an Iyer family, while he is Palghat Iyer who grew up travelling across North India. Popularly known as ChitVish, she is an ardent cook and recipe writer, and shares more than 2000 recipes online on sites like Indus Ladies, her own site Ask-Chitvish, and now, through the App. She is quick with her SMS, answers emails promptly and shares an inseparable relationship with her new toy, the Samsung tablet. Viswanathan is oblivious of such material indulgences and spends his days in scriptural reflection and meditation. This truly reflects the way many elderly couples lead their lives. Traits that we may consider as conflicting, they simply look upon as different. They do not question the differences, they believe in the policy of ‘live and let live’, and gracefully accept each other. As Chithraji says, “We took it for granted that our marriage will work. That is how it was back then.” We enjoy chatting with them about food, philosophy and cyberspace at their cozy flat in Chennai. Jigyasa & Pratibha: To begin with, Chithraji, how did your journey to culinary fame happen? When did you start? She: It has been a life-changing experience, a sort of second chance. I was happy taking care of my home and children. We have a son and a daughter who are both married and well settled in life. In 2003, I became unwell and was bed-ridden for a while. It was quite depressing. 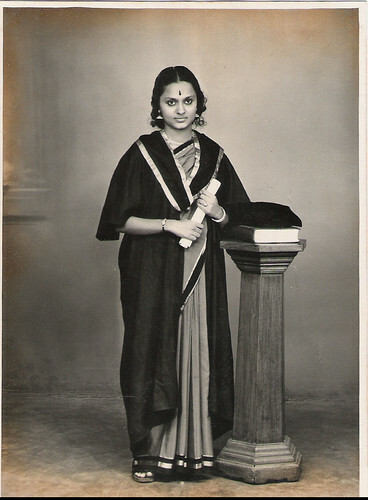 During that time, my daughter Usha turned up one afternoon with a technician in tow, carrying a computer and wires. She got it all fixed in the house along with an internet connection and then told me that it was for me. J&P: Really, just like that? Out of the blue! She: Can you imagine how nervous I felt! I had done a computer course earlier, but I had no practice at all. Now I started learning, though I was quite slow. I learnt to google for food sites. My grand-daughter, Manasvini, taught me how to start a word file in which I would enter all my doubts. Whenever she visited, she would clarify them and I would meticulously write down all her new instructions. Then one day, she showed me how to google my doubts too. After that, there was no stopping me. J&P: Quite the reverse, you seemed to have pressed the accelerator, topped the miles, and earned the title of ‘Internet Maami’. Is this when you started contributing recipes online? She: There were Indian food sites where women could chat and post their doubts. One day an Indian lady from Atlanta posted a query for Poosanikkai Kootu on Indiatastes.com. For four days, there was no response to her query. I then took it upon myself to post the recipe. The next day, similar queries started and I began responding to them. They probably realized I was an elderly woman who knew traditional cooking and were happy to learn from me. J&P: When did Indus Ladies happen? She: Malathy Jey, the founder of Indus Ladies website, happened to notice these online interactions and sent me an email in August 2005. She said that she had just started a website for women and asked me to become a member. I agreed. She then asked me to write a cookery column called Ask-Chitvish. I felt intimidated because sharing recipes as part of online chatting is one thing but writing a column… Could I do it, I wondered for days! My daughter encouraged me saying that Ammamma (my mother) is here and would be able to help me with traditional recipes. I started posting recipes and the feedback and questions started pouring in. To me, it was strange that people just wanted to know simple things like how to make Sambar the correct way. J&P: Indeed a widening of horizons! Is it true that your online interactions have led to more than a hundred of your fans actually visiting you here, at your house? She: It is true and a blessing indeed. I have had more than 200 visitors from the Indus Ladies forum. To me, it just shows the power of technology and internet. How else can I make friends from China, Australia and Boston! Last week, a young lady came along with her husband from Atlanta. She said that she had included Chennai in her travel itenary just to meet me. J&P: That’s truly incredible. Do you feel excited or nervous before meeting them? She: Initially, I felt a bit nervous and made it a point to tell them in advance, “Don’t come with any expectations. I am just a housewife who enjoys sharing what I have learnt from my mother.” In fact, I am the typical Mylapore Maami – plump and content with a simple life. This entire internet connect is not something I ever visualized or desired, though it has really enriched my life. I am now a super moderator at Indus Ladies. What more can I ask for at my age? J&P: What do you enjoy most about the ChitVish phenomenon? She: I enjoy everything about it, but if there is one thing I am deeply touched by, it is the hugging culture. I grew up in a conservative manner where respect rather than a display of affection was considered to be the right thing. So hugging people is definitely a new thing and something that is so beautiful. J&P: What made you have an Application (app) made of your recipes? She: We felt that the best way to preserve all these recipes and reach it to a wider audience especially the newer generations, who are constantly on their phones or tablets, would be an App, which is the latest technology. So we have my recipes on the apple and android platforms on smartphones and tablets for everyone to use, right next to the stove as they are stirring or looking to add the next ingredient! I must tell you, the App, Ask-Chitvish is my daughter’s gift to me on her 50th birthday. J&P: Sounds absolutely awe-inspiring! Have you always had a flair for cooking? She: We were married in 1960 and lived in joint family. I would assist the elders in the kitchen and attend to other chores, but never did the main cooking. My father-in-law realized that I would never learn to cook as long as there were others. Hence, in 1964, after both our children were born, he insisted that we live on our own. Slowly, I learnt to feel comfortable in the kitchen. J&P: That is quite a contrast to your present accolades. How did you cultivate your love for baking? She: In 1968, I heard that the Polytechnic institute was teaching the basic of baking. I was intrigued because at that time, baking was not a common idea. In fact, ovens were hardly available in the market. I asked some friends and all of us decided to join the class. My husband agreed to give his car and we hired a driver, I still remember hiring him for Rs 6 every day. I became very interested and then joined classes for making jams, squashes and juices. J&P: And how did your husband respond to all this? She: He never questioned any of my actions and interests. In fact, he was very supportive, and yet, non-interfering. J&P: Yes, we can see that from his smiling silence until now. Tell us Mr Viswanathan, what do you think of her rise to fame? He: I held a hectic job, left home at 7 am and returned at 8 pm in the night. She took care of the house and her own time. Why should I have objected to anything? I am happy to see her happy. She: He is like that even with the children. In fact, many people ask me what do I gain out of writing my column? I tell them that I am not doing it for monetary benefit, but because I enjoy the work. Yet they question me. But my husband has never ever questioned me. J&P: Is that the key to happiness in a relationship? He: I believe that we must take things as they come. J&P: What is your advice to youngsters about marriage and commitment? She: My advice to believe in the relationship. Each of us has our own background. Even though I married into a family which was much more conventional compared to mine, I did not question the difference. It was dinned into us that marriage would work. He: Freedom. I believe that we must allow people to feel free. I believe in freedom for the children. She: We don’t want our children to be bound by our ideas. Do not ask unnecessary questions and create controversy. I believe that we give them the nest and then give them the wings to fly. He: We have our own interests which keep us busy. She: Yes, I have my friends and I love cooking. That keeps me happy. For him, it is his books and his reading. J&P: Sir, what is that one trait you really admire in your wife? He: I like everything about her and everything that she does. I believe in detached attachment. J&P: In that case, you can get along with anyone. He: Is that not possible? My philosophy is very simple. When you see someone, what are you seeing? The body – it contains millions of cells, but it also contains some energy. That energy is god. So when you see someone, do not just focus on the physical form, but on that energy, on the god within that person. J&P: How do you connect with this energy? He: By staying calm and being quiet. She: Even if I talk loudly, he will just move away. He remains detached. In that sense, he is a true follower of the Bhagavad Gita. J&P: It looks like one does not have to worry about compatibility. He: That is what I mean by say that we must take things as they come. In that case, there will be no room for discord. She: Compatibilty does not happen on its own. No one is going to behave as you want them to. You just learn to accept them for what they are. It is then that we can create harmony in relationships. J&P: Alright, but how will you communicate this profound concept to your granddaughter, for instance? He: She may not accept it at face value. But slowly, it will take effect. We must start by accepting and respecting what she does. J&P: It makes sense, because then you are showing her how to accept other people. He: Yes, and this can be done with practice, by retaining the energy in one’s system. This is why one must be cautious about what one eats. J&P: So, are you referring to satvik foods? She: Yes, he never eats out, he eats simple food without onions and garlic. In fact, he has never eaten at a restaurant. He: Not even in my own daughter’s wedding. I am very strict about what I eat because if I am not careful, it upsets my stomach. She: On the other hand, I love everything, I love taste and flavours. First published in August 2012 in Harmony – Celebrate Age Magazine for the column – Soul Food and Soul Mates. 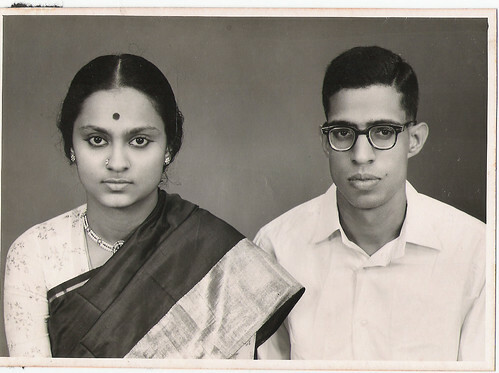 Part-2 of this post is the authentic Tamilian recipe of Thavaladai from the kitchen of Chithra & Viswanathan – the 13th couple featured in this column.